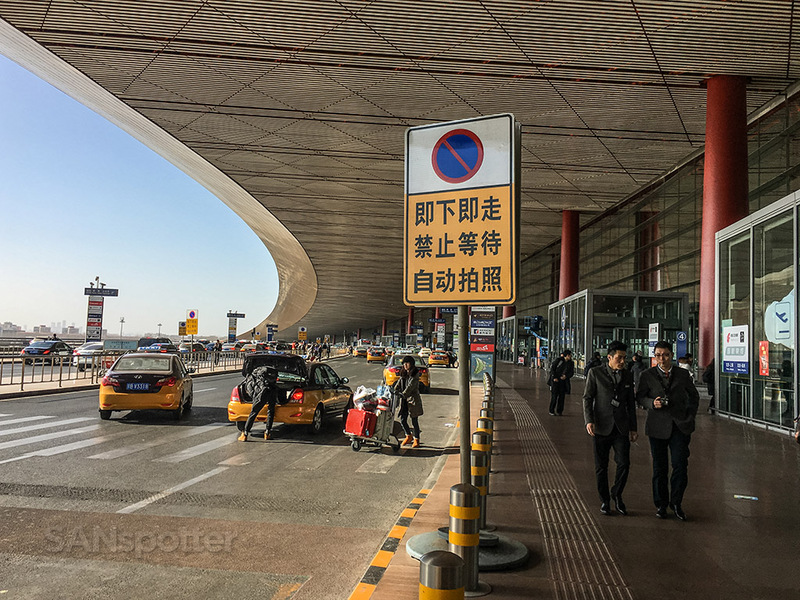 After a very brief and brutally cold two days in Beijing, it was time to head home (well, at least to Japan for one night). My flight from Beijing to Tokyo wasn’t scheduled to depart until later in the afternoon, so it gave me plenty of opportunity to take things slow and be super lazy that morning. It’s not very often that I can be slow and sloth-like while traveling, so I was really enjoying the idea of having gobs of time before my flight this afternoon. Once I made sure that I had my Priority Pass card in hand (just to be sure I’d have access to a decent lounge), I was on my way! You’re lucky that this picture of the arrival at the airport isn’t a complete and total blurry mess. 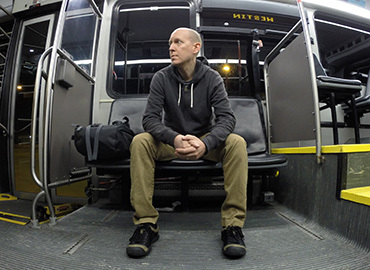 My hands were still shaking from what was probably the scariest ever taxi ride I’ve ever had my life, and it felt so good to set foot on solid ground again! Not only did it feel really good to be on solid ground again, it felt especially awesome to be out of the frigid air for good. 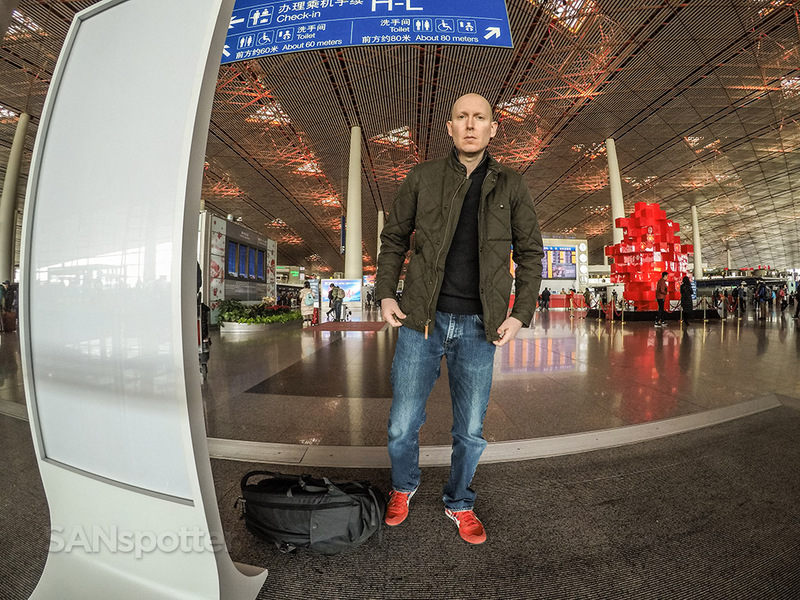 It was a bit too cold for my liking here in Beijing (I couldn’t feel my face at all), and thankfully I didn’t have to deal with it anymore from this point forward. Time to defrost! 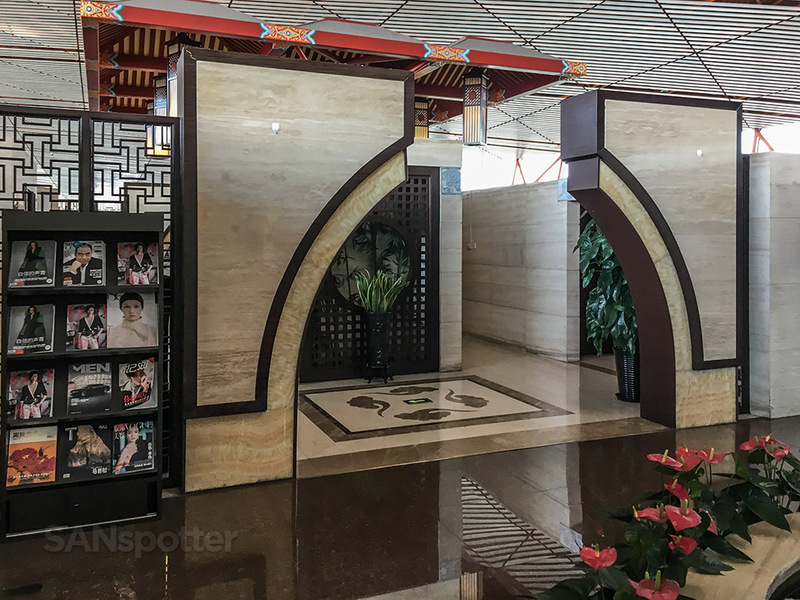 I arrived at the airport nearly 4 hours early, primarily since I wanted to have some time to look around, spend some time in the lounge, and have a really nice lunch somewhere. Little did I know that the Japan Airlines check-in counter didn’t open until 2 1/2 hours before the scheduled departure time to Tokyo. I found out the hard way of course, standing there at an empty ticket counter with an hour and a half to go before I could check in. Oops. Where the heck is everybody? I’ve got a point to catch! In 4 1/2 hours, yeah, but still. It wouldn’t have been so bad if there was actually something to do in the main ticketing hall, but there really wasn’t. 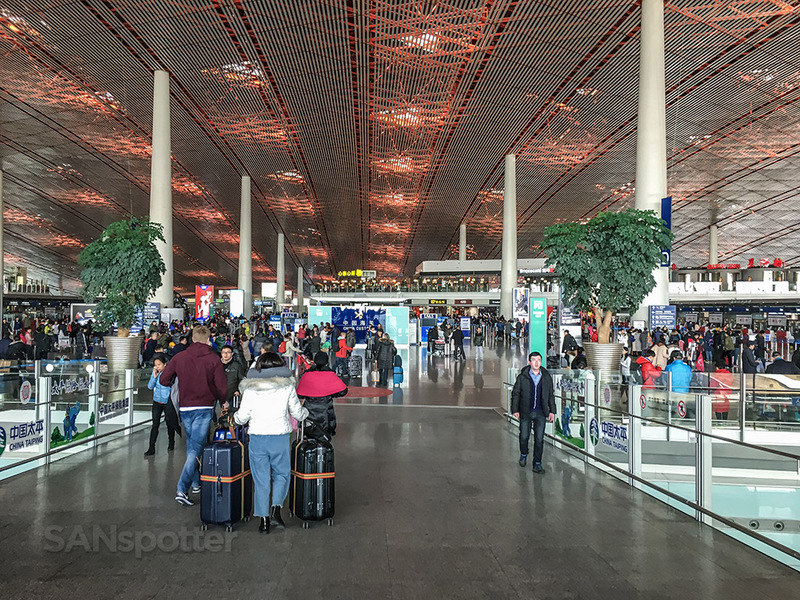 There are only a few small cafés and souvenir shops sprinkled about, so I could really do was walk the ticketing hall back-and-forth about 20 times as slowly as I could trying to kill as much time as possible. Going outside for a walk was simply out of the question. It was cold out there, and I had more than my fair share of cold weather on this trip. My still-frozen hands and face couldn’t take anymore of it. I passed the time taking a lot of pics and video footage of the ticketing hall for the trip report, but it turns out that this selfie tells the story the best. Do I look bored and frustrated or what? 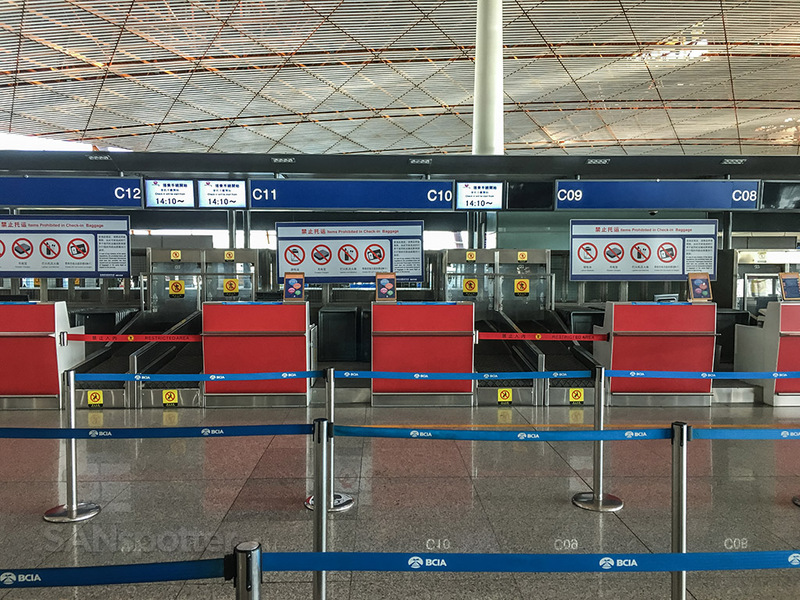 It goes without saying that I was the very first one in line to check in once the ticket counter opened, and from there it was a easy dash through security and passport control. 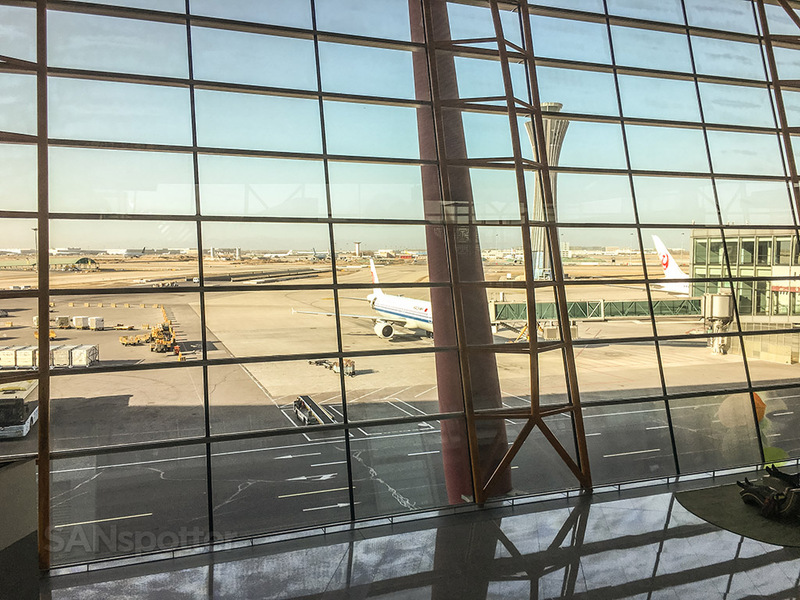 I found myself airside inside the main terminal in less than 15 minutes, which was about 45 less than I was expecting. 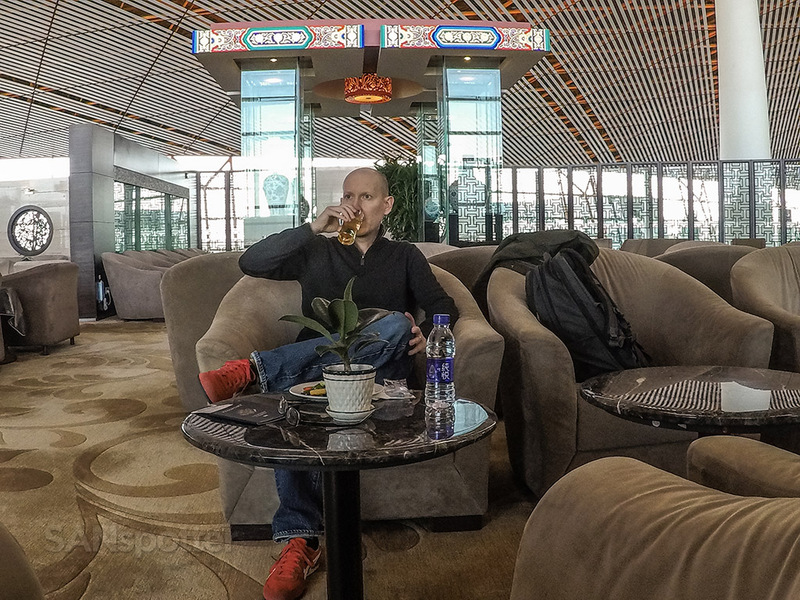 I still had plenty of time to waste before my flight to Tokyo, but I was hungry and I did want to check out the lounge, so killing two birds with one stone seemed like the right idea. 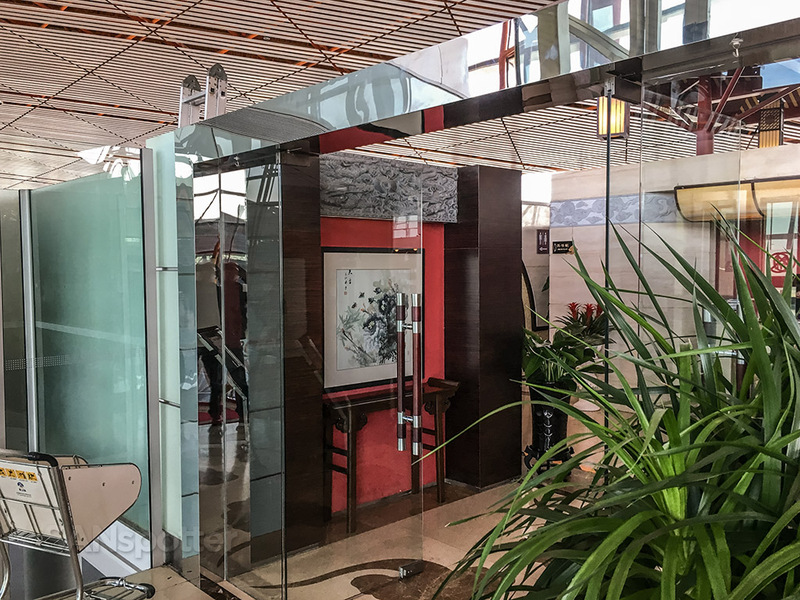 All Japan Airlines business class customers (and Priority Pass members) such as myself have complementary access to the BGS Premier first and business class lounge. 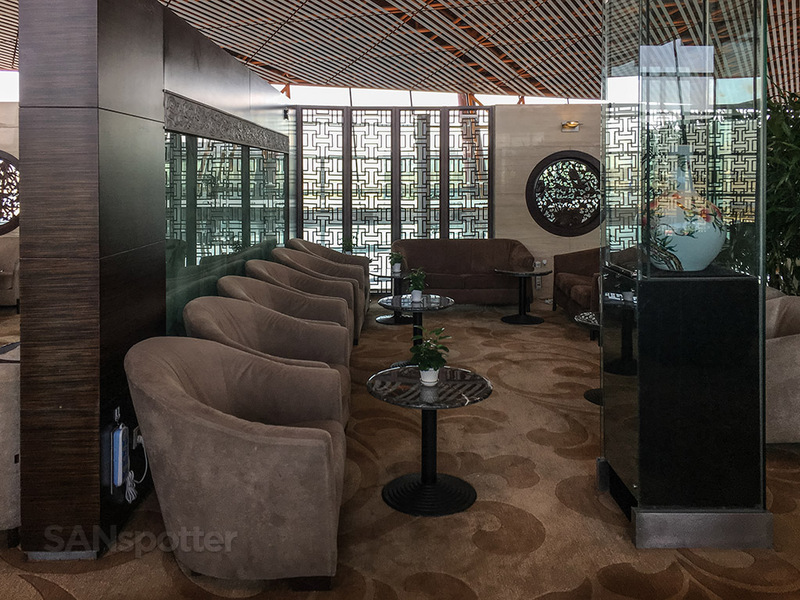 Sure, it was a bit troubling that I had never heard of a BGS Premier Lounge in my life before this, but it was the only lounge I had access to today so I wasn’t going to complain about it. Let’s go check it out! 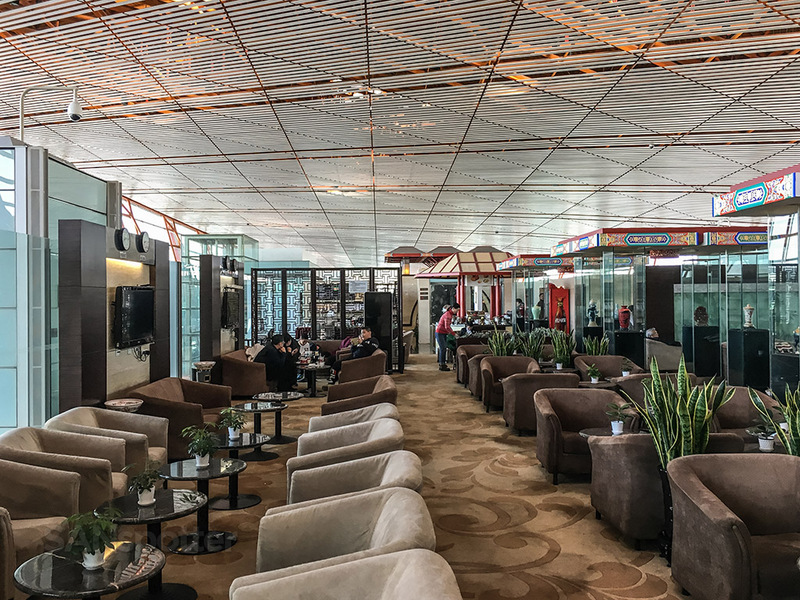 I don’t know about you, but airport lounges seem a lot more special to me when they are on the upper level. 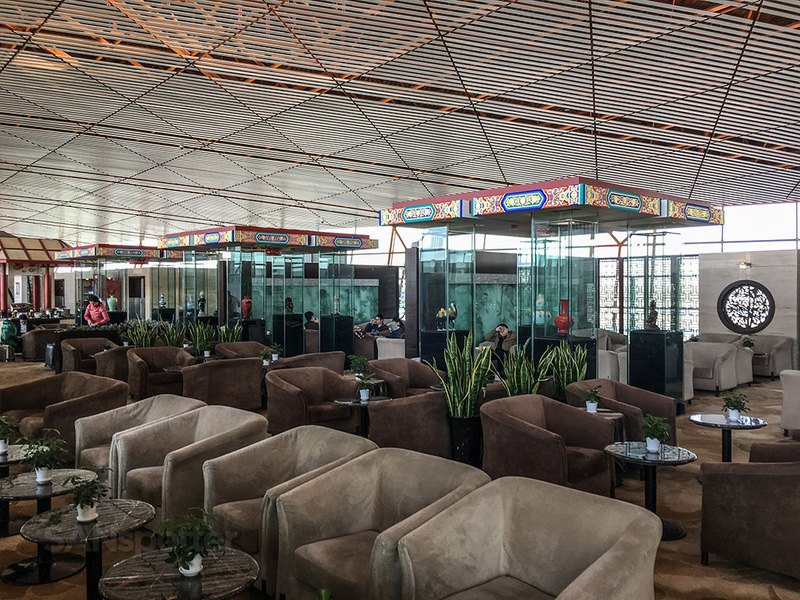 I realized right away that this lounge was definitely on the lower-end side of the spectrum, very similar in quality to the Grand Lounge Elite at Mexico City Airport I visited last September. 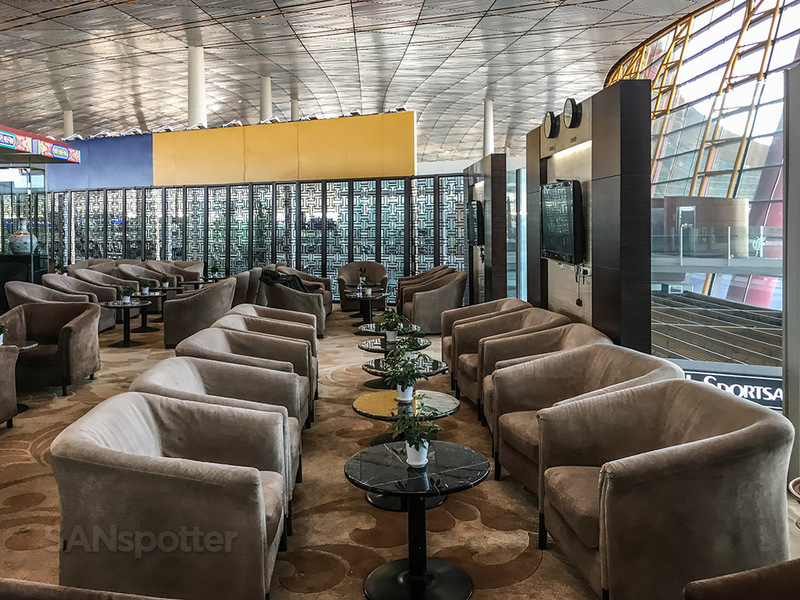 Yeah, this was clean and fairly nice looking, but the quality of the furniture and general layout seemed low budget and nowhere near on the same level as something that you would see in a OneWorld or Star Alliance lounge in a major airport such as this. Any lounge with live fish swimming about is a good one, right? So far so good. 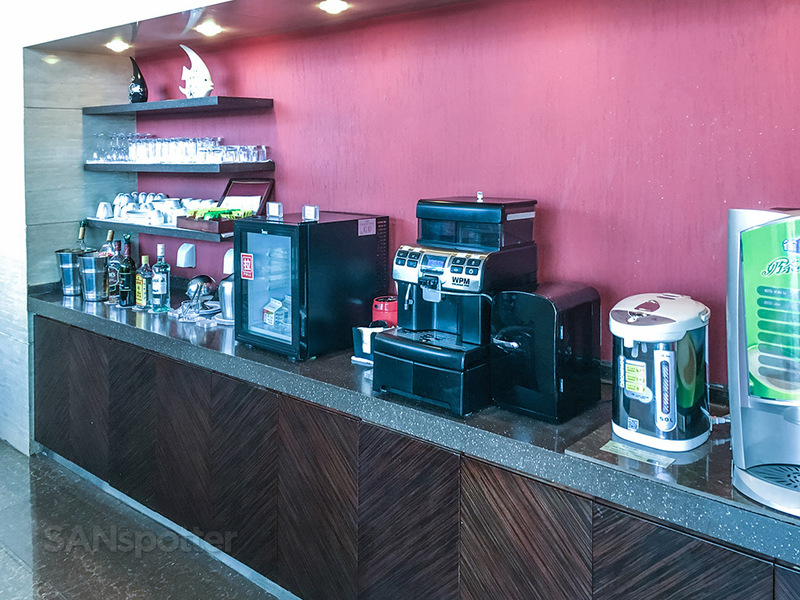 The interior of the BGS Premier lounge. I know this may sound really weird, but these chairs instantly reminded me of elephants. It’s actually a decent looking space, though it did seem a bit dated and stale. The high ceilings were huge plus though. 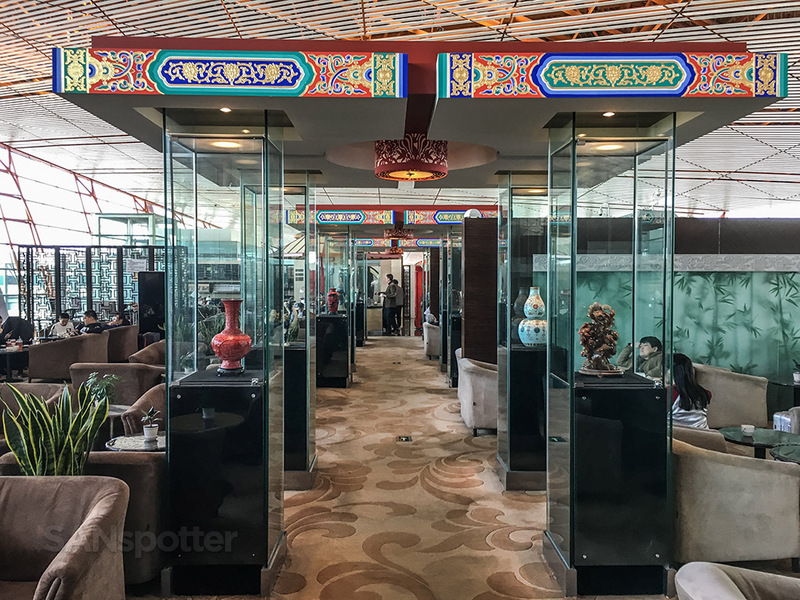 It’s really hard to describe the style of this lounge, but it was nice to see that there were some definite Chinese flavor in here with these sculptures on display. It’s a good thing that I’m not an interior designer, because I would’ve had an irresistible urge to put fish tanks where those sculptures are. 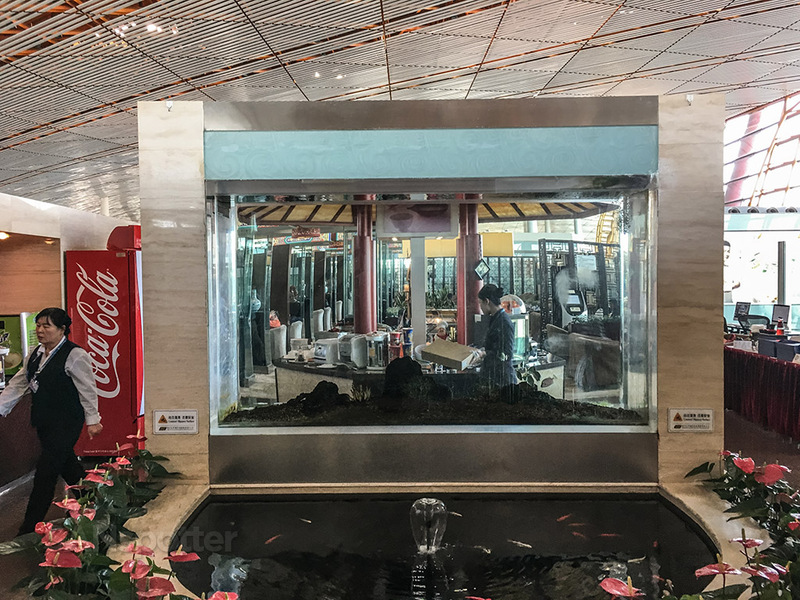 It’s impossible to have too many fish tanks in an airport lounge! I felt pretty lucky due to the fact that there was basically nobody here at the time of my arrival. I had the place all to myself – for a little while at least, and all these elephant chairs were mine. Mine! Some of the adjacent knooks and crannies were a bit dark, but they were a nice alternative to sitting out in the main room. The highlight of the BGS Premier Lounge, by far, is the food. 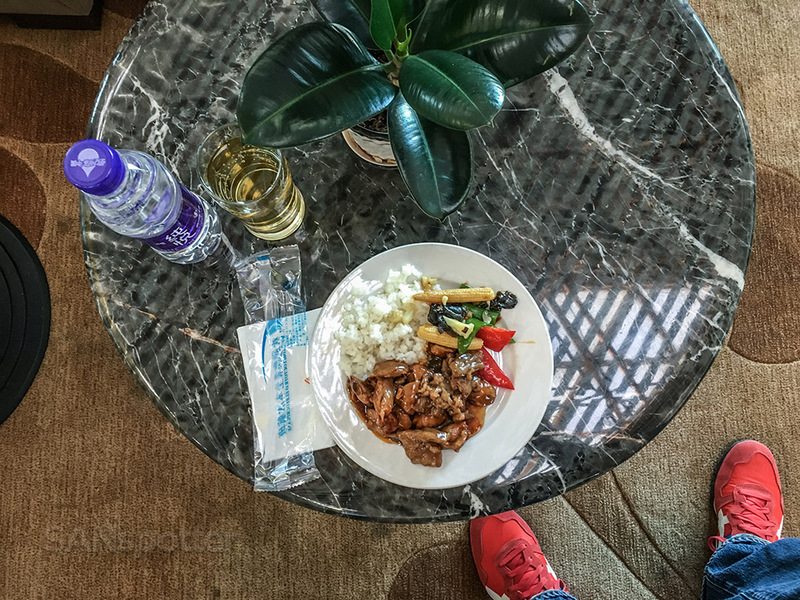 It was not the best lounge food that I’ve ever had, but there was a lot of it and it was very hot and fresh. It definitely satisfied my craving for lunch, and I certainly didn’t leave the place feeling hungry. 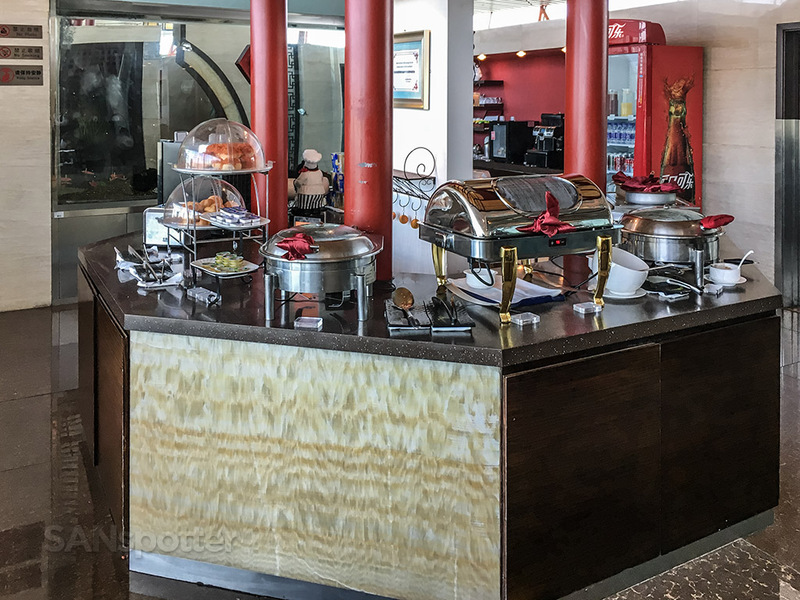 Most of the food was situated here on this central island near the entrance to the lounge. And every bit of it was mine since I was the only one here. Mine mine MINE! Most of the food looked pretty good, so it was really hard not to be a total pig and try a big scoop of everything. Beverages were against the adjacent wall. My sincere apologies to the lounge staff for drinking nearly an entire jug of apple juice during my visit. Hey, I was thirsty! There was also this setup on the other side of the food island, which confused me a bit. 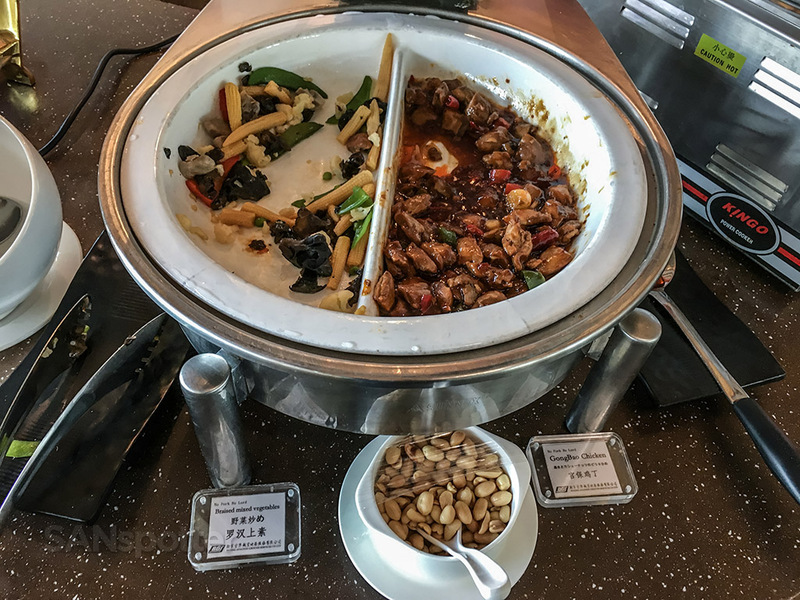 I had no idea what was being served here, and the attendant looked as if she didn’t speak a word of English (and I don’t speak Chinese) so I didn’t even ask. I see two pots of soup, and a portable oven. Or…perhaps this was a meth lab? She was cooking up something good, that’s for darn sure. Chugging down the first of five glasses of apple juice. The really weird thing about it is that I don’t even like apple juice, but at that moment it was the only thing that seemed to satisfy my thirst. By the way, this was my view as I sat there eating lunch (and slamming back the apple juices). That JAL 787 tail on the far right is my bird to HND! 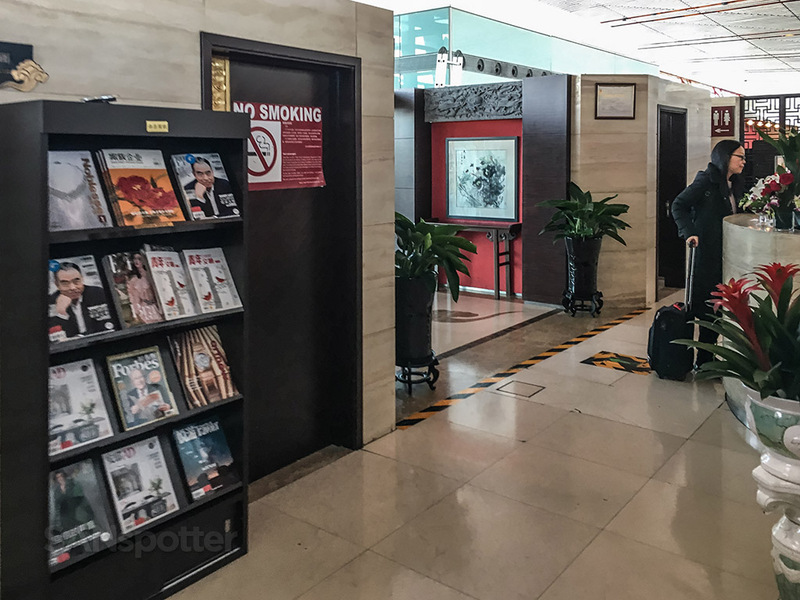 There was also a really nice selection of magazines and newspapers to read, but who wants to read the latest issue of Forbes when the views to the outside are so good? The exit. On my way out to catch my flight (and find a bathroom thanks to all that apple juice). 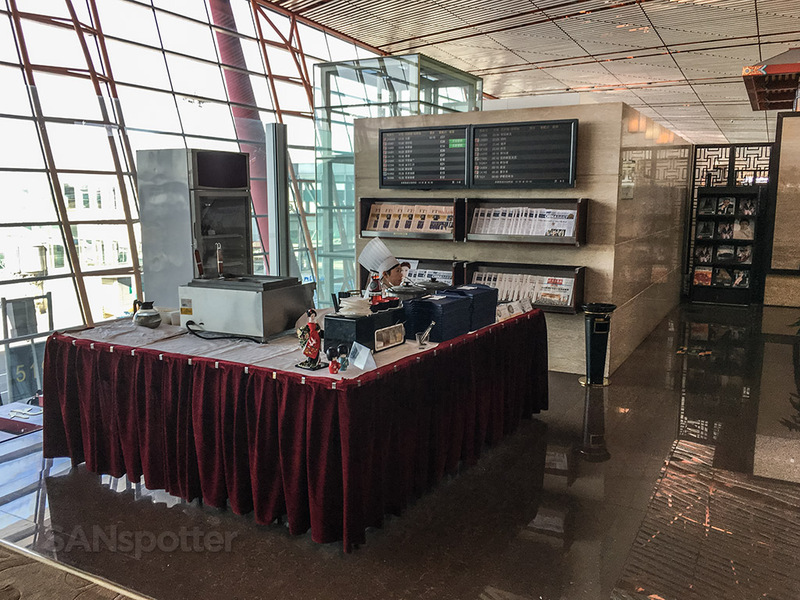 In conclusion, I can honestly say that while this was a decent place to grab a quick bite to eat and relax for a bit, it’s probably not worth visiting if you have access to any other lounges in this airport. The staff was friendly and the atmosphere very quiet, but it just seemed very old and crusty like it hadn’t been updated in a very long time. The best way to describe it would be like visiting your grandparents house. Grandma and grandpa have a comfortable place full of friendly people and good food, but staying on the cutting edge of style and design hasn’t been a priority for them for at least 30 years. 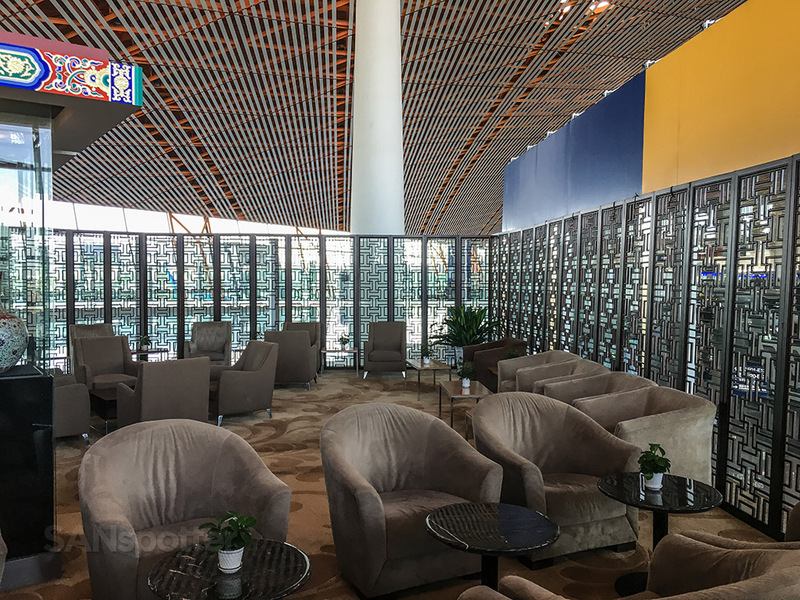 That kind of thing is perfectly OK for grandma and grandpa, but not so much when it comes to a business class lounge at a world class airport such as PEK. 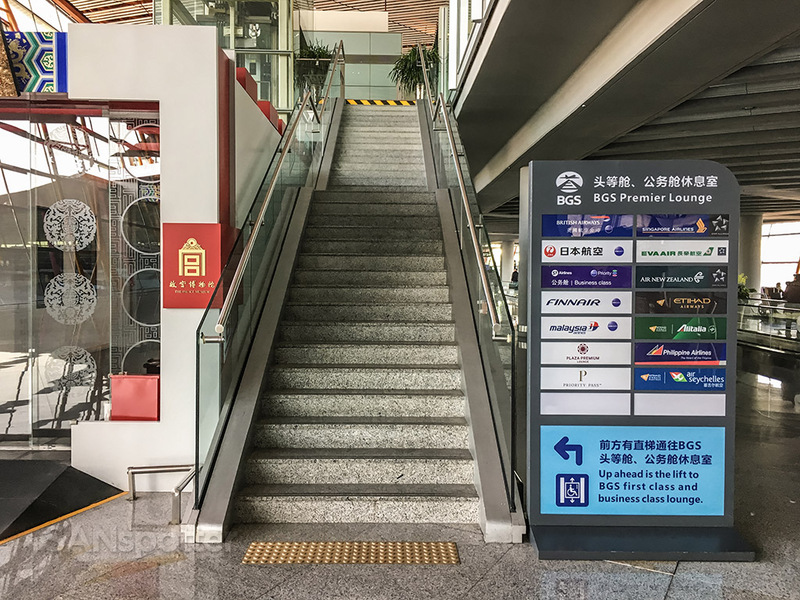 I’m definitely going to do some lounge-hopping next time I fly through this airport, which should be easy thanks to my trusty Priority Pass membership. So that means you agree with me, right? Haha! The Elephants are getting so old that they are going to stampede. Thankfully there were no stampedes during my visit!